There’s a little game I like to play whenever Macworld.com posts a news article or review of MYOB’s AccountEdge—guess how many comments it will take in the Macworld.com forums before one of our aggrieved neighbors to the north takes MYOB to task for not having a Canadian version of its small business accounting software. Wondering when AccountEdge returns to Canada? The hockey puck tells all. MYOB US must hear that comment a lot, too. 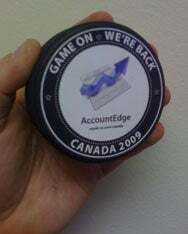 Because at the business software maker’s Macworld Expo booth in the South Hall at Moscone Center, representatives of the company had a gift for any passersby who happened to inquire about a Canadian product—a hockey puck announcing AccountEdge’s return to Canada. AccountEdge’s return to north of the 49th parallel became possible after Acclivity bought MYOB US—along with its Mac and PC development teams—from the Australian-based MYOB Ltd. in November. Acclivity had been the U.S. distributor of AccountEdge prior to the purchase. Typically, an AccountEdge update for the U.S. product arrives in the fall—AccountEdge 2009 debuted in mid-November, for example. 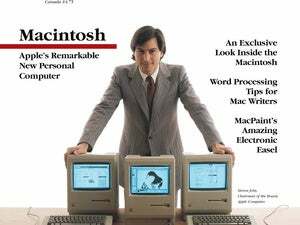 But Canadians won’t have to bide their time waiting for a U.S. update so that the software can return to their home and native land. “There will a 2009 Canadian release before the next AccountEdge product,” Acclivity managing partner Tom Nash told me on the Expo show floor Wednesday. And I’ve got the hockey puck to prove it.